This site is a general collection of thoughts, comments and trivia related to my first and second CDs, How I Got To Here... Volumes 1 & 2. This started out to be a single CD but, as the song list continued to grow I knew I wouldn't be able to eliminate enough for just a single CD without feeling the result was incomplete. At that point I simply resigned myself to the obvious solution of producing a 2-CD review of a partial list of the songs that had a lasting influence on my musical tastes and writings. When I first heard Tim Hardin I was struck by how his lyrics cut right to the point and didn't rely on the mystic imagery that was popular by some artists of that period (1965-6). His love ballads were some of my favorites but I lacked his vocal talents (and still do, unfortunately). His are still some of my favorite songs. This is from his album entitled Tim Hardin 1. I don't really remember who I learned this tune from but it was during my early college days when sung limericks and other "racy" tunes (for that period) were in favor in the coffee houses of the day. I enjoyed it for its understated nature while still getting the "point" across, as it were. Who knew I used to do songs of this sort? This is an old English ballad that I originally learned from the Ian & Sylvia album, Four Strong Winds. Their version is done in a sort of country style almost bordering on bluegrass, back-beat and everything. For some reason I started playing it in drop-D tuning and slowing it down a little; over the years it evolved into the version you here on this CD. I have included more of the original lyrics than Ian & Sylvia did as well. This is a tune I learned from the Jim Kweskin Jug Band and can be found on their album from 1965, The Jim Kweskin Jug Band. It was another byproduct of the meeting referenced in the previous discussion. What fun music to play - especially with wonderful musicians like Mike Guggino who contributed the mandolin on this recording! This song was done by Jim&Jean on their 1965 album Changes along with several others that are among my favorites. Though they were more "pop" than most of the folk artists I was following, the driving beat held stead by bassist Harvey Brooks and the lovely intertwining harmonies of their vocals made them one of my favorites. This song uses the imagery of the period to express that age-old longing for acceptance and love - regardless of its source. And, speaking of Tom Paxton, he has got to be one of our nation's mose prolific songwriters - and one of our best. 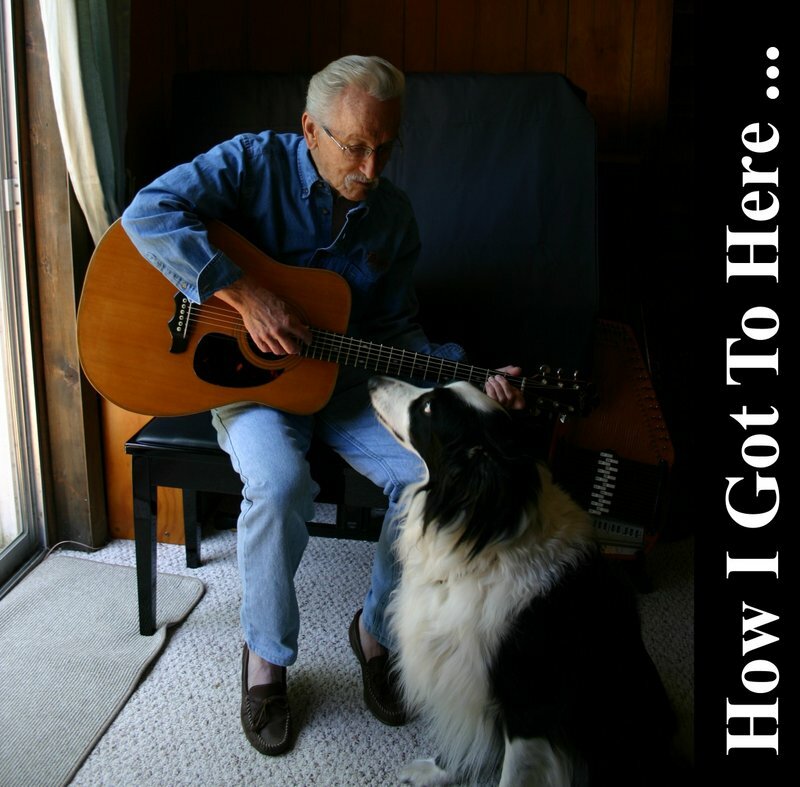 This tune appeared on (I think) his first album, Tom Paxton, in 1965 and was the tune I listened to for hours on end to learn how to Travis-pick the guitar; the simple accompaniment of the song made it a perfect example for the fingerpicking style to be clearly heard and understood. My trio (Rita, Rail & Raker john) made it one of our "standard" tunes that was always done in our set list, regardless of the audience (mostly FSU students and Tallahassee "townies"). In the spring of 1966, when it came time for us to play our last song together before Rail and I left for California, Rita said, "Somebody just pick a tune." and this is the tune I picked - for obvious reasons. Judy Collins did this version (more or less) on her 1965 In Concert album with only banjo and cello for accompaniment and it has haunted me ever since then. As unlikely a source as Shel Silverstein seems to be, he was well-respected as a songwriter and this, to me, is one of his best - I only hope I do it justice... Special thanks to Tim Gardner for the mournful fiddle part! I heard this on Gordon's first album in 1968 and loved the feel and texture of it. There was a lot going on in my life at the time and the thought of being on the road, drifting from place to place, appealed to me at the time - regardless of the consequences. Tommy Powell was a friend of mine in Fort Myers, Florida, introduced to me by Rail Guthrie back in the 60's. This is one of his songs that I have always wanted to do but (until recently) did not have a recording of to learn it from. Fortunately, before Tommy's passing in 2011, I recieved a rare copy of him doing the song. It seemed only fitting that I should record his song using the guitar it was probably written on so I used the Martin 000-18 I got from him in trade for my Martin D-35 back in 1982. Thanks, Tommy, for everything. This song was learned from the group Hearts & Flowers who were the "house band" at the Troubadour on L.A.'s Sunset Strip around 1966-67. They have been widely credited with being the first of the "California Country Rock" bands that so many now associate with The Byrds, Gram Parsons, The Flying Burrito Brothers and, ultimately, The Eagles. Hearts & Flowers was a trio utilizing guitar, banjo and autoharp to present folk-flavored country-inspired tunes penned by themselves and other notables at the time such as Waylan Jennings. This particular tune is about what all musicians that migrated to California to become discovered experienced; while we were focused on the music, the producers, managers and other beasts of prey were focused on the money to be made - and if they didn't see any, you just didn't exist... This first appeared on the album Now Is The Time For Hearts & Flowers. This is not the first Bob Dylan Song I learned, nor is it the last one - but it is the only one that has stayed with me over all these years and still rings as true as it did the first time I heard it. My rendition has changed a bit over the years, as I gained more experince in life, and now it has that authentic sense of loss that, I think, Bob felt when he wrote it. I hope you enjoy it. This song appeared on The Blue Ridge Bakery Boys' first CD Half-Baked which was released in 2012. I've ebnhanced the sound a bit by adding a bass part and having Mike Guggino work his magic on the mandolin. I first heard this song done by The Greencards as, basically, a bluegrass tune done in a somewhat upbeat tempo with mandolin and fiddle driving the tune. The more I listened to the lyrics, the more I thought of it being more of a love song, requiring a more thoughtful rendition. About two years ago I re-arranged it for DADGAD tuning and, while I liked the suspended chords this brought, it made it more difficult to do as an ensemble piece so I changed it back to standard tuning but kept some of the suspended and added ninth chords I so dearly love; that's the version you'll hear on the CD. The funny thing is that I recently saw a YouTube video of The Greencards' current lineup doing this tune and they are now doing a version that sounds closer to mine than their original arrangement. Go figure... John R.
I learned this from the self-titled Redbird CD and loved the harmonies and general sentiment of the piece. It's pretty sparce and reminds of some of the early pieces Tom Waits wrote for guitar and voice... Again, thanks to Mike Guggino for the tasteful mandolin accompaniment! This one I heard one morning on my way to work while listening to The Bob & Tom show out of Chicago. Their guest was an ex-boxer turned singer/songwriter/band leader from Tupelo, MS and he played this song as a solo acoustic piece; it was fantastic! So I went to Amazon when I got home from work and played the sound bite of it off the CD - not good! With the whole band behind him it was a far more rocking number and all its subtle nuances were missing. So I tried for some time to get a copy of the broadcast where Paul did it acoustically but to no avail. So here it is the way I think I remember hearing him play it that morning. And, oh yeah, I wrote an extra verse for it but I'm not saying which one it is - you'll just have to guess. I hope you like it. Another of Verlon's songs that got the eye's watering for me. I asked him about this song and when he knew it was "completed". He said, "Interesting you would ask that because I had been performing it for over a month without the last paragraph when I started asking myself about how his daddy must have felt and how his mama took it too. So I wrote the last part - then I knew it was done." And the final song in the "Prostitute Trilogy" is this one, learned from a Nanci Griffith CD, Other Voices Other Rooms, where she did it with John Prine - a great song done in a great arrangement. This follows the somewhat normal pattern of other tunes of this genre but goes a bit more into the back-story. This is a song from Guy Clark's Boats To Build album, released in 1992. He sings this as a duet with Emmylou Harris on that album so this version is a little different, in that regard. It's a great sentiment and one that I hold as true in my life - this is for Rocky... Many thanks to the rest of the original members of The Blue Ridge Bakery Boys on this song. This is a song I first heard on Jonathon Byrd's 2002 CD The Waitress and it reminded me of other songs played in a similar manner by Tome Rush, Geoff Muldaur and others in that modal sort of key. Yet this had more yearning to it than Tom's "Poor Man" or the others. It also came at a time when I had started playing with Bradford Carson in the group "Chicken-Fried Possum" ( www.tinyurl.com/CFPossum ) and I was playing a lot of tradtitional tunes. So here it is for your listening pleasure.. This is a song I learned from Tom Rush's first album, Blues, Songs and Ballads. It turns out that this is a mating of two separate musical pieces - the lyrics of the traditional song "Diamond Joe" and the melody from the tune "State Of Arkansas" which was done back in 1942 by Lee Hays for a radio show by The Weavers. This song appeared on Len Chandler's first album, To Be A Man. His back-story on the song involved having recently read the biography of Mata Hari, the alleged spy during the second world war, and some American history regarding the Revolutionary War with England. The tune certainly has that English harpsichord style and the lyrics match perfectly. One of my all-time favorite songs. Fred Neil was a folk singer originally from the Miami area and I heard this tune of his done by Oz Bach at the Beaux Arts coffee house in St. Petersburg, Florida, in 1962. Oz was also a 12-string guitar player and had a great, resonant voice (though not as resonant as Fred's) that really carried the tone of this song. 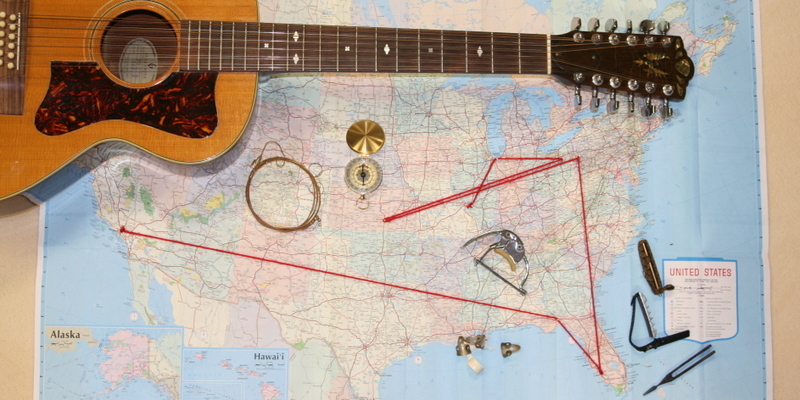 I was struck by the wonderful imagery of the lyrics as they were so simple and contained many of the sights I had personally seen, living as many places around our country as I had. I still love the line of "I've seen a June bug in July...". Thanks, Fred, for such a wonderful song. From the album Tear Down The Walls by Vince Martin and Fred Neil.